One of the top pastimes that all ages can enjoy in Destin is snorkeling. The water is incredibly clear, making it easy to see the underwater life. With your mask and snorkel in tow, kids can improve their swimming skills. The best places to snorkel are along the east Jetties and the grass flats by Crab Island near the Coast Guard station. The sandy bottom makes it much safer for those younger swimmers who are just beginning to enjoy snorkeling. There are plenty of ways to maximize fun while snorkeling in Destin. With pontoon boat charters, you can head out away from the crowds and snorkel in a quieter, undisturbed area. You can also rent snorkeling equipment from several vendors close to the shoreline, if you haven't brought your own. Destin is packed with great landmarks and exciting destinations, but few can compare to Crab Island. This area north of the Destin Bridge was once an island, but it is now a sandbar that is about waist deep under water. Crab Island is a wildly popular place for those who want to enjoy the water, the sun and great company. Although Crab Island is a favorite for all ages, kids will definitely appreciate a visit. Boats are anchored in waist-deep water making it a safer area to wade around, float on tubes, enjoy a picnic, and be with family and friends. There are floating restaurants, a water park, and vendors bringing snacks, cold drinks and ice cream. This only adds to the family friendly atmosphere while surrounded by breathtaking scenery. Boat charters in Destin, FL is far and away one of the top planned activities for families with children. To start, you'll enjoy the privacy and freedom of having your own personal party boat. Be sure to check out the capacity of pontoon boats to charter in the Destin area. You’ll want to accommodate everyone in your party. The right pontoon boat means that you can easily fit the whole family, or several families. Double-decker pontoon boats can accommodate up to 12 passengers and believe it or not, you can even bring along the family dog for a small additional fee! What kids will love the most about the double-decker pontoon boats is the water-powered slides extending off the upper deck. These should be used in waist-deep water or deeper for the safest fun! 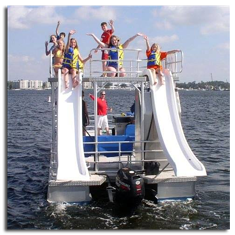 Your kids will never forget how exciting it is to have a private slide on their very own pontoon boat charter. Many of the visitors who come to Florida's coastline arrive specifically for the fishing opportunities. It is easy to see why, because there are options to fish ranging from local piers, the beautiful bay, bridges, the coastline or deep at sea. Pontoon boats are the ideal platform for fishing the bay in Destin for redfish and trout. Pontoons are available to charter and for small additional fee you can bring your fishing gear. This is the perfect opportunity to teach children more about fishing, and to do so in a safe, secure environment. For many individuals, spotting dolphins in the wild is a magical, once-in-a-lifetime opportunity. Spotting dolphins is a favorite activity for kids. Spotting dolphins is common from pontoon boats in Destin. Popular places to see dolphins include the harbor, surrounding Crab Island, Choctawhatchee Bay and near the coastline. Kids of all ages, not to mention their parents, will have a blast in Destin. Double Fun Watersports can add to the adventure of a lifetime by chartering unique, double-decker pontoon boats perfect for creating lifelong memories for the entire family.